In 1929 the Roseau Parish had three out-stations. 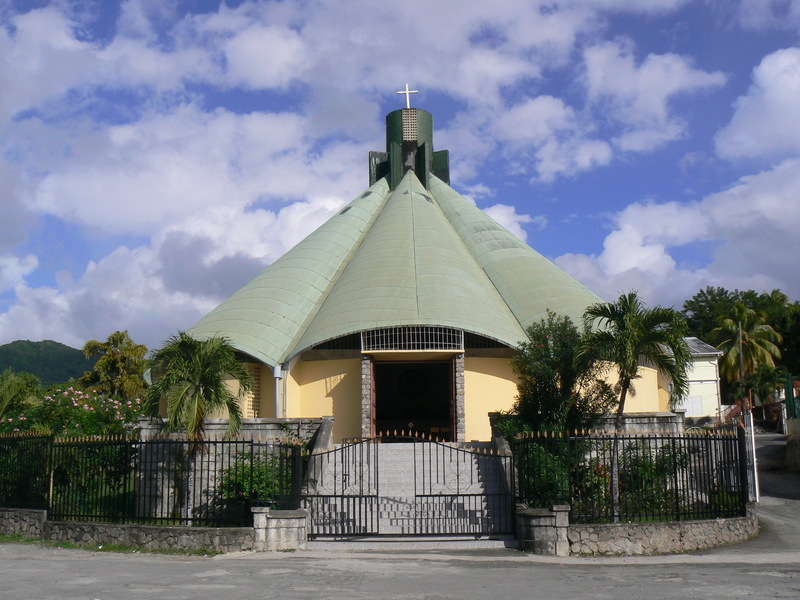 THE ECCLESIASTICAL BULLETIN OF ROSEAU (EBR) described that “in the country districts chapels-of-ease existed at Bellevue [Chopin], Morne Prosper and Laudat.” In Giraudel, Holy Mass was celebrated in a “good-sized house of a planter”. No mention was made of Charlotteville (Newtown) , Loubiere, Trafalgar or Wotten Waven till much later. “On account of the influx of country people to Roseau and especially the Goodwill quarter, it was decided to build a new church . To this end, Mr. Francis Potter, owner of the Goodwill estate, kindly made a grant of [ a portion of land measuring] 100 x 200 feet, to which he added somewhat later another grant for the purpose of building a parochial school. [EBR]. This land was were located in an area called “Balahou Town” now called Pottersville. The foundations were laid in December 1929, under the supervision of a French priest of the FMI order named Fr. Barreau. 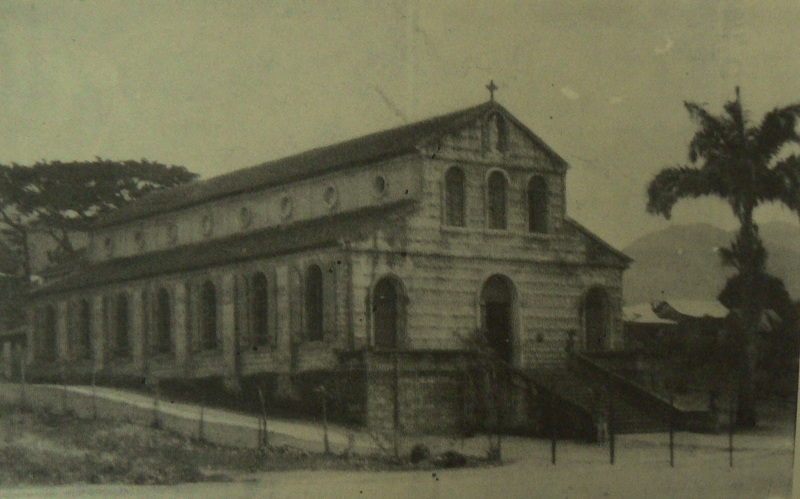 The Fils de Marie Immaculée (FMI) or Pères de Chavagne had a proven record of building churches and schools all over Dominica. It seems that the communion rail and the Stations of the Cross were also very beautiful. The blessing , performed by Bishop James Moris, a Redemptorist, took place on October 5, 1930. The patron saint of the church was St. Alphonsus Ligouri, the founder of the Congregation of the Most Holy Redeemer or Redemptorists. Much later did this church become the parish church of the Parish of St. Alphonsus, which was canonically established on February 2, 1954. The parish was administered by Belgian Redemptorists Fathers for many years till the local clergy took over . In 1957, the newly ordained local priest Kelvin Felix was posted to the parish. According to Kenneth Richards, Fr. Felix was the one who “arranged for the old wooden windows in the church to be replaced with metal and glass windows, giving the place of worship a more lightsome appearance.” AMIDST THE SUGAR CANES- 1991- Kenneth A. Richards. On August 29, 1979 Hurricane David caused severe damage to this almost 50 year old church. The roof was torn off, windows blown out . Many arches and columns were cracked and damaged beyond repair. The task of building a new church fell on the shoulders of Fr. Eustace Thomas. This entry was posted in Lost Churches, St. Alphonsus' church in Pottersville and tagged destroyed church, Goodwill church, Pottersville church, St. Alphonsus' church on September 30, 2014 by Bernard Lauwyck.